My first retreat and I had a blast. 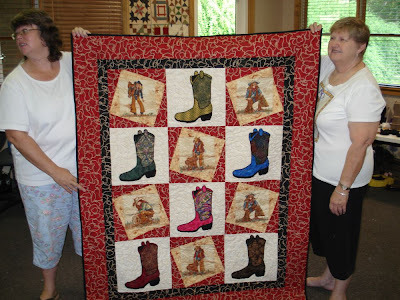 You get a bunch of ladies together that love to sew and what can you expect but to have a good time. 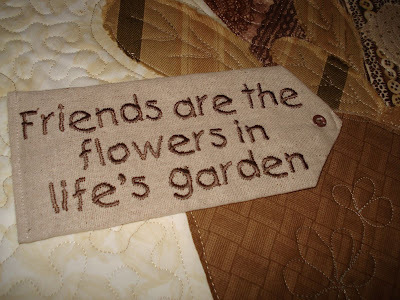 This post is going to be a lot of pictures and then I'll post our wall hangings and more later. Geraldine and Sandy both worked on the Underground Railroad. This is Sandy's version. 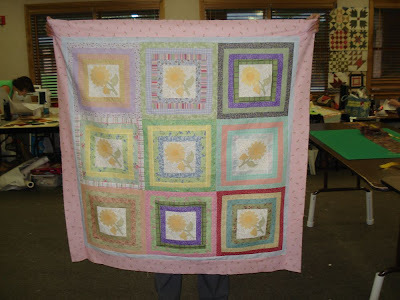 Kathy's quilt is going to be gorgeous when it's finished. Katherine is the daughter of Kelly and I think she out sewed us all. 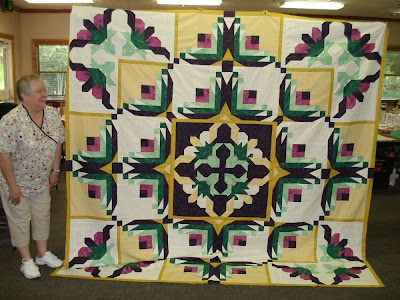 LaWanna and Dorothy holding LaWanna's quilt. I received my Christmas in July package today and it is so cute. 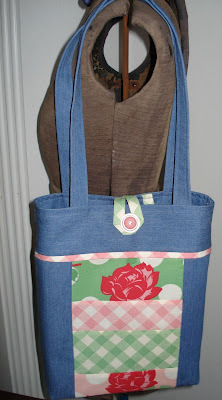 Just look at what Jo from Tas @ http://scrapnstitch.blogspot.com/ made and sent my way. I love it. All the hard work and detail is so perfect, I just wish my hand embroidery was that good. 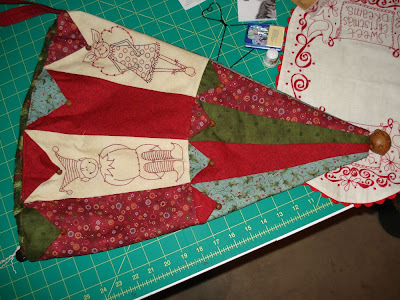 The stocking is huge, I put it on my cutting mat so you could see how big it is. It is going to look perfect on my mantel and the detail in the mat just amazes me. Thank you so much Jo for all your thoughtfulness and hard work. 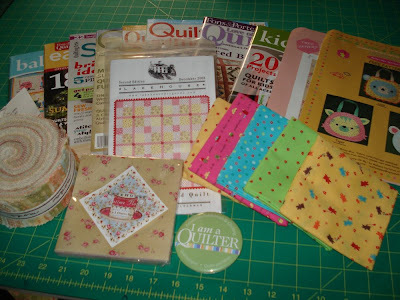 Make sure you go to Linda's and Stephanie's blogs and see all the goodies going to their new homes. I have one more day before I head out and still have a long list to get completed. The wall hanging still needs the binding and a tag on the back. 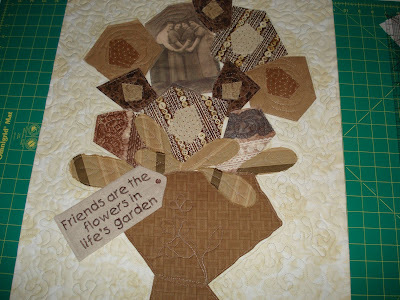 I wanted something fun for the girls weekend and friendship fitted in somewhere on it. 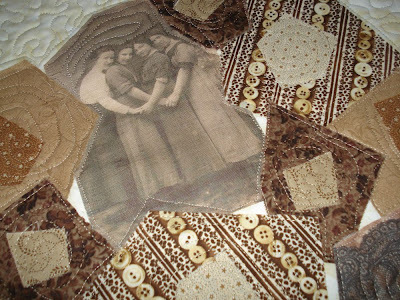 I haven't done the raw edged applique and just started cutting and putting things together. Maybe I'll make a pattern, but first I should ask if you can tell what it is? This is the first time for me to go so I'm not sure what we are doing with the wall hangings, but I know it will go on my door. I've got the camera packed so lots of pictures to be taken. PS: Is anyone else having trouble moving your pictures after loading them on your post? I need to post more...Sneak Peek and I'm going on a retreat!!! 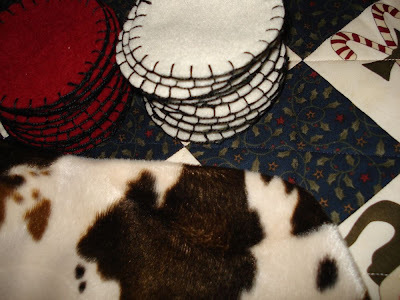 Oh, I have got to slow down and post, visit other blogs that I love to visit, sew, cut fabric and get ready for a retreat. 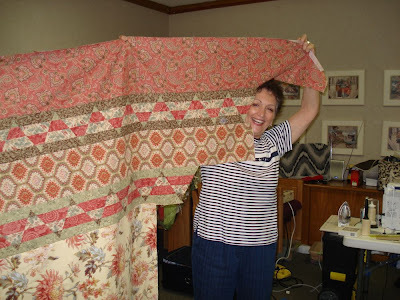 I get to bring fabric to sale at the retreat and we leave this coming Thursday. 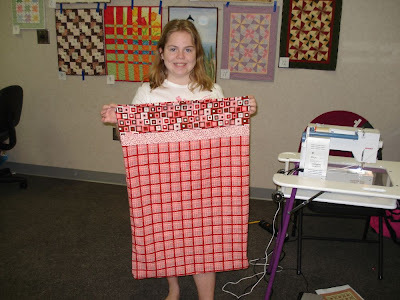 The ladies buy it better if it is ready for them to take in fat quarters, 1/2 yards or 1 yard cuts. Hope to take some pictures of what I'm taking. This is the first retreat I've been on with the guild members and it will be a blast. 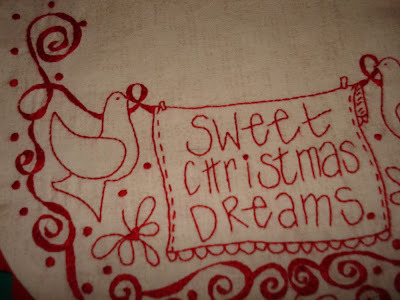 The picture is a sneak peek of just part of an item I'm sending to my Christmas in July partner. It is a big tease of a picture. I know this is a short post, but I'll be back soon. 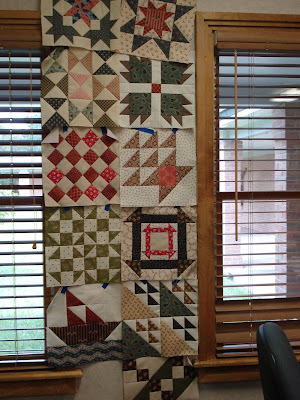 I have to make a wall hanging for the door of my room. 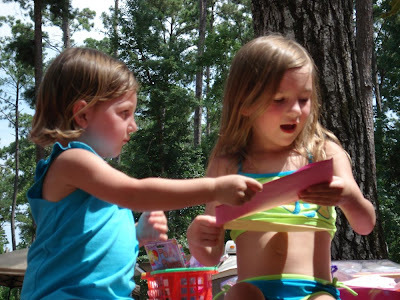 We are having a little contest and games that we play to win fat quarters. 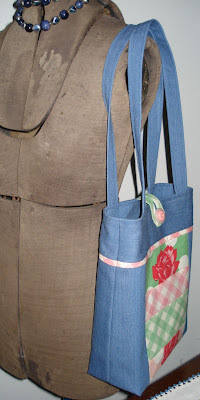 I had so much fun making Linda's new bag pattern. 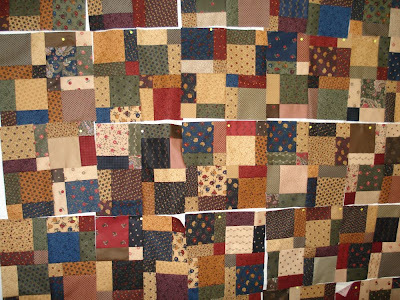 You have to go see all the different versions and colors @ http://all-stitched-up.blogspot.com/. I think it's so interesting to see such talent be given a pattern and all the creative juices see it made in so many different ways and they all work. 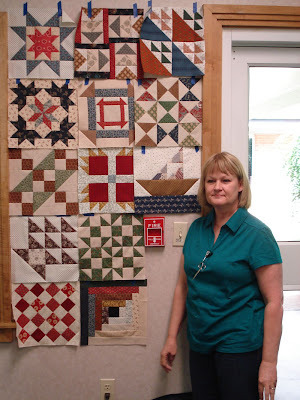 Thank you Linda for a great pattern and to give us an opportunity to test it out. Best of Luck on your new adventure. I haven't been able to visit every one's blogs lately, but I will soon. 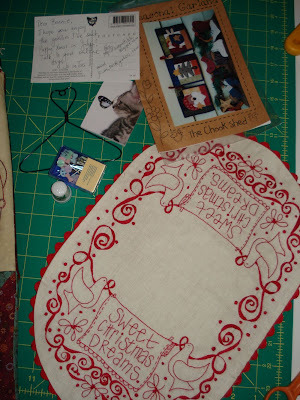 Putting the finale touches on the Christmas in July Swap, gotta mail it, count down is on. 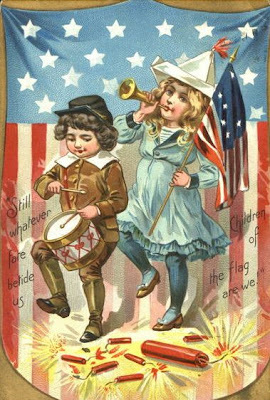 We had a great July 4Th weekend and I haven't stopped since I've gotten home. It was so HOT, that was the only thing. 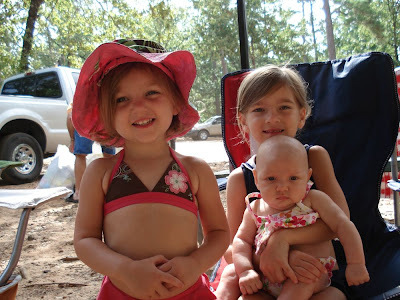 1st grandbaby's birthday was great for the kids, but us grownups melted. Had a blowout on the boat trailer coming home and my husband and son looked down and they were changing the tire in poison ivy. So they ended up throwing water balloons at each other after it was changed. If you get into poison ivy and wash it off right away, you shouldn't break out. (They didn't, Yea). Sorry, I can't move my pictures around once I downloaded them. Got home late, washed clothes and then off to Houston moving all of my son's belongings, just me and him. Helped him set up his apartment and came back Tuesday late. Now by this time, I can't move to well. 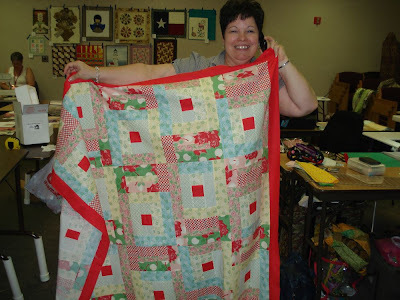 Today, I had fun and went to my little sewing bee and had a little class on a new project. Just need to border it and I'll show a picture. 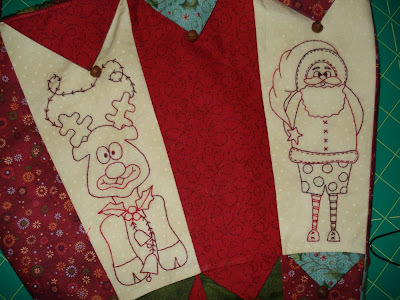 I did mine in Christmas fabric so it might go to my swap partner as an extra something, not sure. 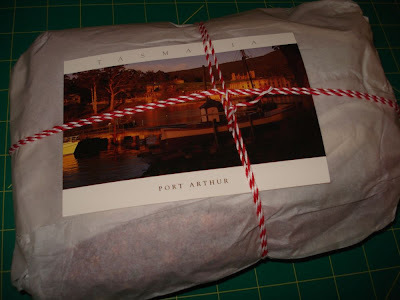 Now before I left for the July 4Th weekend, I got a package of some items I won from Jennifer @ http://sweetlibertygrace.blogspot.com/. Look at all this loot. I was so excited and I had so much to read on my trip. Thank you so much Jennifer for this giveaway. If you haven't visited her blog, you need to go, she has a great one. Tomorrow is another day...My Mom's camp was broken into and since Mom has passed we have stored a lot of items from her house here. So now I have to go see what all is missing. We know they took the air condition unit, this is how they got into the camp. I hope they stay cool, cause I'm really hot about it. 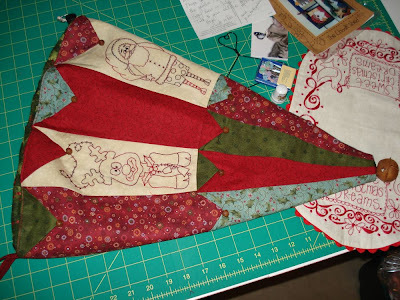 My plans for the weekend is to sew, sew, sew. It always relaxes me.